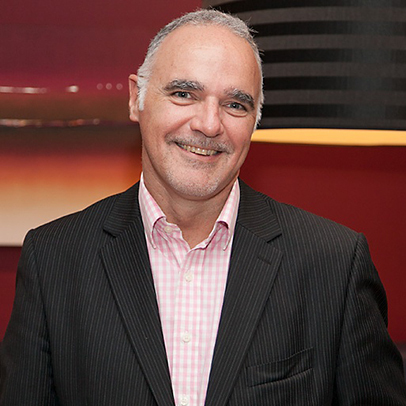 David Williams is Director for Corporate Engagement and Staff LGBT+EE Forum Lead at Middlesex University. Here, he shares what Pride has done for him, and why he feels it’s important. Recently I went to a briefing for Pride in London 2017, otherwise popularly known as Gay Pride. Pride is a series of events that happen in cities, both large and small, that celebrate being gay in today’s complex straight world. It’s a powerful symbolic action that started after the 1969 Stonewall Riots in New York City when gays fought back against police brutality. Since then Pride has expanded around the globe. Pride is a celebration of life, love and liberty. It isn’t just about parades and partying. It’s about the gay community being visible and belonging in society and belonging in this uncertain world. The volunteers who put on Pride in London and all the other volunteers across the UK and the world, have an enormous responsibility, particularly at this time when people are braver at being nasty on social media, and individuals express their lack of understanding (or hate, prejudice) in the street. Parades cost an enormous amount of money to cover such matters as security, the parade, cleaning up, insurance, toilets and first aid, often amounting to huge sums up to £1,000,000. So why bother? Pride matters because it’s not always obvious that our world is built around straight privilege. With Pride parade celebrations, events and parties, then discussions take place and LGBT+ people are seen for more than just a caricature of who we are. We can be seen as real people: as sons, daughters, friends and even parents ourselves. To me, Pride is a celebration of acceptance, and self-acceptance, of understanding and love. Pride is being able to be who you are, and to demonstrate you can love who you want to love with no fear of discrimination, intolerance or judgement. Prides in 2017 are more important than ever, all the advancements made in recent years such as gay marriage can easily be repealed – they are only paper thin; there is a need for the LGBT+ community to stand together, be strong and be visible. The first time I attended a Pride Parade after coming out was in 2011. I attended for personal reasons as I needed to demonstrate publically what I had just come to terms with privately around my preferences and lifestyle. It was a declaration that I really was a part of the LGBT+ community and I didn’t want to hide it anymore. The experience was amazing, being able to spend a whole day being inspired by this varied assortment of LGBT+ people who were celebrating being out and open about themselves. I admired their confidence in who they were and vowed I would work to support others in their own journey. 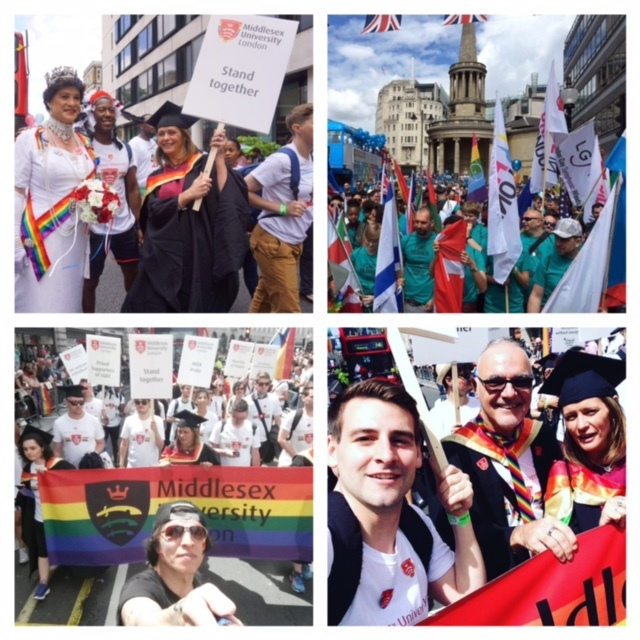 In 2016 my employer, Middlesex University, walked at Pride in London for the first time; we had over 50 students, staff, allies and friends walking together and demonstrating our acceptance of everyone, without exception, as an organisation. It was a fantastic day together, we were surrounded by love, laughter and had unbelievable support from those watching. Many alumni made themselves known to us and complimented our diversity and openness. Pride is a celebration of life, and to celebrate what everyone has the right to have, the ability to love and be loved. The theme in London this year is ‘Love happens here’; I am sure this is so and I cannot wait to help celebrate and demonstrate that this is the case – somewhere out there is a person hiding, confused, seeking courage, feeling as I did for many years and I want them to see that it’s okay to be yourself – whatever that is – and that the community will be welcoming. Pride in London takes place on Saturday 8th July 2017. Other Prides take place around the UK and overseas throughout the year. 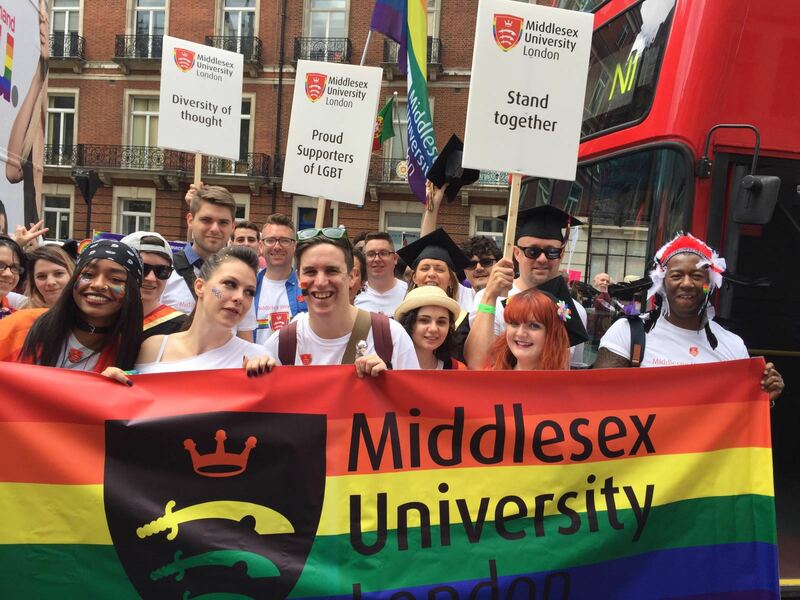 For more information visit the Middlesex University LGBT+ Everyone Else Forum.